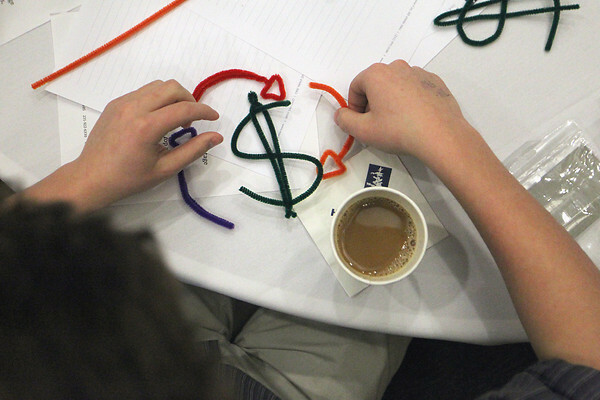 Mary Kay Ash team member Mitchell Mosley of Traverse City Central High School uses pipe cleaners to design a logo for the group's company during Wednesday's Junior Achievement of Northwest Michigan Youth Summit for Entrepreneurs. 70 students from 15 high schools in six counties attended the event at the Hagerty Center in Northwestern Michigan College's Great Lakes Campus, where, in groups, they were challenged to repurpose a current item of their choice and develop business and marketing plans to present to judges. The winning team each received a "money tree" with $100 on it. Groups were named for famous entrepreneurs such as the cosmetics giant Ash.